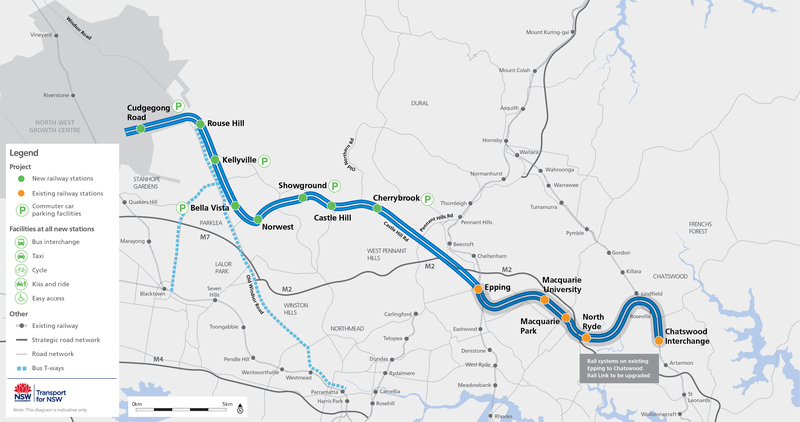 Friday’s post on whether the Northwest Rail Link (NWRL) should be a metro generated a large volume of comments, sufficient enough to warrant a new post to present some highlights and respond to the points raised in them. It’s worth reading the original post for some context if you have not already done so. The argument here is that signalling will allow double deck trains to achieve the same frequency that moving to single deck would provide. The problem with that argument is that the same signalling would also improve the frequency of single deck trains, so single deck would still achieve greater frequency and lower headways than double deck. That is why the single deck Paris metro can run 40 trains per hour, while its double deck RER system runs 30 trains per hour. Smaller tunnels remains the least defensible part of the NWRL as proposed. Concerns like this are justified. The decision to build the NWRL as an independent line, to be operated privately, does appear to be an ideological one based on the belief that the transport union is at least partly to blame for Cityrail’s high operating costs. Jeff Kennett’s Liberal government in Victoria took such an approach when it eliminated guards from its trains in the 1990s. However, while these decisions were political, they most definitely do have operational impacts, ones which in the Victorian case resulted in an improvement rather than deterioration to the transport system. This is not necessarily a bad thing. The problem with widening the stairs, is that it doesn’t eliminate the bottleneck, it only shifts it deeper into the train carriage. The space between seats in the saloons upstairs and downstairs is only wide enough for 1 passenger at a time to approach the stairs, so even if the stairs are wide enough to handle 2 passengers, only 1 will reach it at a time. Removing seats can allow more passengers to reach the stairs, but by getting rid of seats you are eliminating the primary advantage of double deck trains over single deck ones – higher seated capacity. Double deck trains on the Parisian RER system do achieve lower dwell times, allowing them to have headways as low as 2 minutes (compared to Cityrail’s 3 minutes). However, it remains a fact that Paris’ single deck metro trains still have lower headways at 85 seconds. Similarly as with stairs, widening doors would not decrease dwell times as they are not the bottleneck. Wider doors with single deck trains, however, would see a drop in dwell times. “What bothers me about running this line as a metro is that is it connecting the least densely populated suburbs of Sydney with the ‘global arc’. There is much uncertainty about this. Take, for example, the fact that more resident of North West Sydney work in the Global Economic Arc (7.7%) than in the CBD (7.3%), or that places like Macquarie Park are forecast to see a high rate of jobs growth in coming decades. While Northwest Sydney is mostly low density suburbia, the areas around the corridor of the NWRL are not, and will only get more dense once the line is up and running. It might be that these stations North of the Harbour do not get the sort of passenger turnover that the CBD does. But they will certainly have a similar or higher level of turnover as other inner-city stations on the network. Given single deck metros are more suited to high turnover style patronage, that is why the NWRL would still work as a metro despite it’s long distance. “How would one from Parramatta or Burwood or Mascot get to Macquarie Park easily? They can’t. These are valid concerns, but have little or nothing to do with the type of line that the NWRL should be. Whether it is single deck or double deck, it still will not serve the sorts of connections listed above. However, in the defence of the NWRL, traffic on the M2 is much worse than the Old Windsor or Windsor Rd in my experience. So if tackling congestion is the top criteria, then a Hills to Macquarie Park link is more important than a Hills to Parramatta link (which does currently exist in the form of the Northwest T-Way). Additionally, the NWRL appears to have been criticised simultaneously in parts for both not connecting to the CBD (despite connecting North Shore trains set to arrive every 3 minutes in peak hour) and for being CBD centric (despite linking up the Northwest with the Global Economic Arc, which employs more residents of Northwest Sydney than the CBD does). Paris Metro trains carry a maximum of 750 passenger whilst the latest RER Line A trains carry up to 2600 – which is about 3.5 metro sets. As I said – silly comparison. Is there a source for those numbers? And are they comparing like with like? Train length? Standing passengers per square meter? I haven’t researched the numbers in depth, but I highly doubt that a double deck train of the same length and standing/seated passenger density as a single deck train could carry over 3 times as many passengers. Intuition suggests that even 2 times as much would be not be possible. It is completely bonkers to build tunnels etc to NW Sydney that won’t fit double-deck trains even if in the immediate term it is used for metro-style operation. the marginal cost would be tiny compared to the cost of retro-fitting when sanity finally prevails and we notice that a low density outer urban line can’t jutify metro expense. An obvious alternative would be to build the NW line as an extension of the noth shore line to Chatswood, and operate the Chatswood-Hornsby north shore line as a metro shuttle. When we build the Chatswood-Crows Nest link and/or 2nd Harbour crossing, the NW line would take these over and the metro would extend via the existing North Sydney-Chatswwod line to Wynyard with an additional stop at The Rocks – and then on to link to a metro standard inner west, Bankstown, Airport (or whatever) line. But of course this won’t happen becasue ot doesn’t meet the Liberal objective of getting the unions out of the railaway – and makes the over-supplied north shore execs change trains. The Paris system is certainly worth comparison. Just as long as it does not go as far as where the power comes from. RER is overhead; the Metro is third rail. Perhaps this thought has given Gladys an idea to further balkanise Sydney’s public transport for ideological reasons. As if the Albury break of gauge experience was not of sufficient memory! As to dwell times at Town Hall which seem to affect everything else, how much responsibility is due to the pathetically narrow platforms? Would that it was more like http://goo.gl/YkU8k. It is probably a silly question, but is there scope for another platform on the other side of the line? Then passengers could enter on one side and leave on the other like at Olympic Park which was designed to allow for the emptying and filling of a whole train at the one stop. By high turnover I presume you are referring to the fact that, unlike most other Sydney lines which fill progressively and empty in the city (or Redfern), NWRL re-fills and empties along its length. But what is the extent of this “high turnover”? Unlike real (London, Paris) metros which have passengers leaving and joining at numerous junctions, there is only one junction on NWRL: Epping. And in its myopic view of the world, State Planning says Epping will always be residential. And they want 22 storey units to prove it. On NWRL passengers will join progressively from Rouse Hill to Epping. In the morning peak there is little reason to leave the train until the next stop. Many alight and few join at Macquarie University, trains then progressively fill as they proceed to Chatswood where it will terminate. That’s hardly high turnover and certainly does not justify abandoning the double deck advantages for imaginary shortening of a little dwell time here and there. PS I know it is not your creation but “Global Economic Arc” sounds a bit grand. A bit like “World Series Baseball”. Does Ted Baillieu refer to it that way? I think you’re right about the Global Economic Arc name. I personally dislike the NWRL viaduct being called a sky train. Do keep in mind that most of the stations along the eventual NWRL route (Castle Hill, Epping, Macquarie University/Park, Chatswood, St Leonards, North Sydney) are large transport hubs that will deliver passengers to them via feeder buses. All but Epping are also major employment centers too (though it probably makes up for it by being a major rail hub). An integrated network, with frequent and fast rail services whose station catchments are multiplied via feeder buses, would provide a noticeable improvement to Sydney’s transport network. In the case of the Global Arc, that will result in the high turnover previously mentioned. Should the North West Rail Link be a metro?